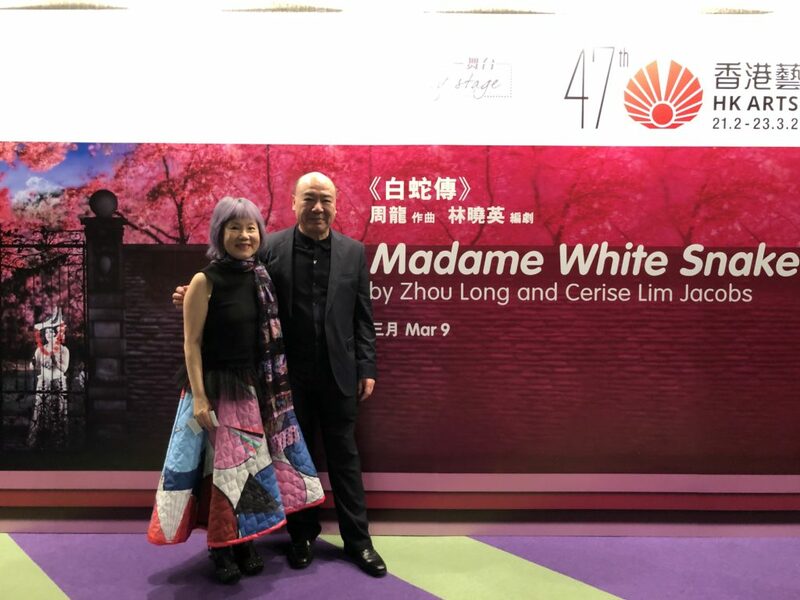 What an exciting March it has been: Leaping forward into longer days with Daylight Savings Time, welcoming spring with its green shoots of daffodils and tulips, and, the Hong Kong premiere of Madame White Snake on March 8 and 9! 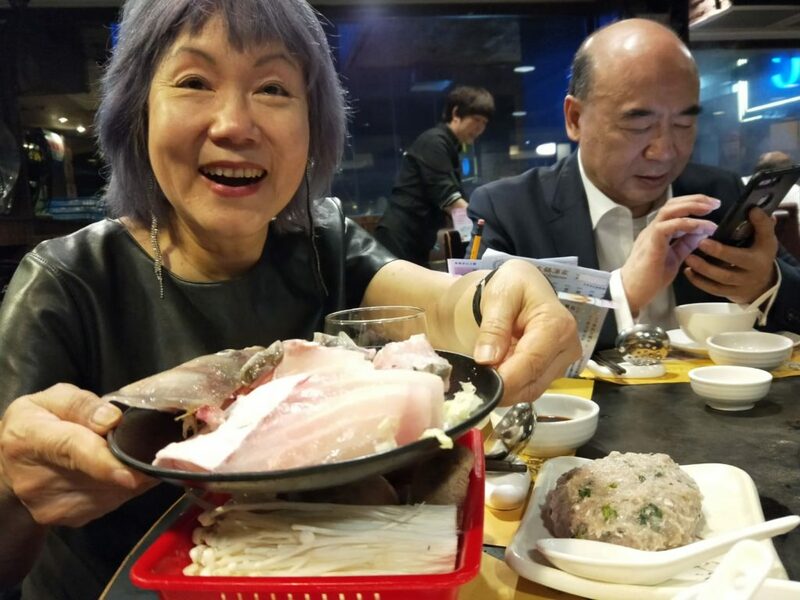 Hong Kong was a smashing success. 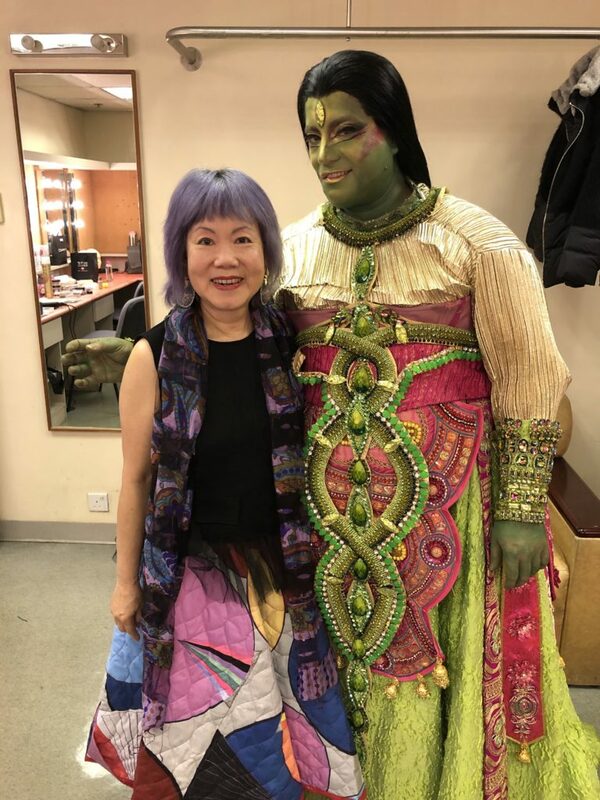 The audience was visibility moved by the show, rifling through their bags and pockets for tissues to wipe away tears as the White Snake drank the potion given to her by her beloved husband and transformed back into a snake. 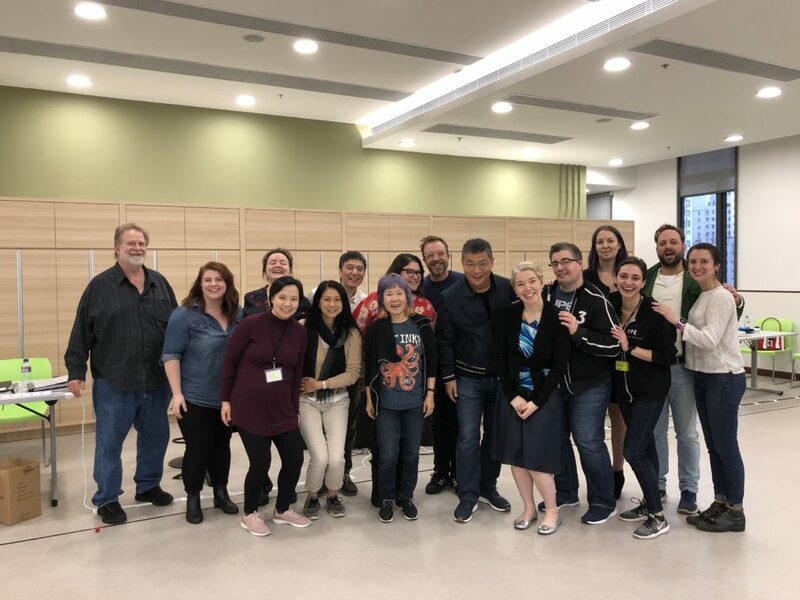 We had a joyful reunion with the singers from the 2016 production – Susannah Biller, Michael Maniaci, DJ Gong, and Peter Tantsits and lots of hard work in the rehearsal studio which was in a Methodist Church, a modern multi-story building in the heart of Wan Chai. One day, our elevator stopped at a lower floor and we were greeted by the sight of an open coffin, scores of mourners and thirty flower wreaths. The Church was obviously not just used for rehearsals! Our hosts, the Hong Kong Arts Festival, were warm, supportive and utterly professional. We ate dumplings galore and roast goose and walked the streets of a city that truly never sleeps. I was particularly affected by the audience reaction to Madame White Snake. This is an audience steeped in the Legend of the White Snake. It’s in their DNA. Our White Snake upends their expectations by transforming this iconic character from an over-romanticized victim of an evil Abbot to a powerful warrior fighting for control of her destiny. As for the Green Snake – ah the Green Snake. Always portrayed as a beautiful willowy sister-like companion to the White Snake, he/she is now sung by a gender bending counter tenor in all his male/female glory jealously protective of his beloved mistress. The audience was enraptured. They were fascinated by this new look at an old myth, entranced by the visuals and enchanted by Zhou Long’s music. Thank you, audience! Thank you, Hong Kong Arts Festival! 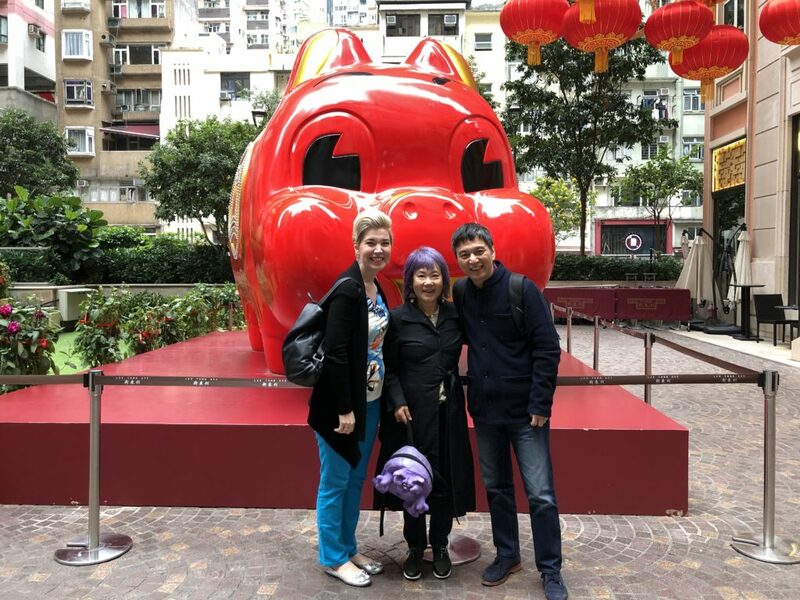 Soprano Susannah Biller, conductor Lan Shui, and Cerise in front of giant red pig celebrating the Year of the Pig. Cerise and Michael Maniaci – who can compete with the beauty and ferocity of a green snake? 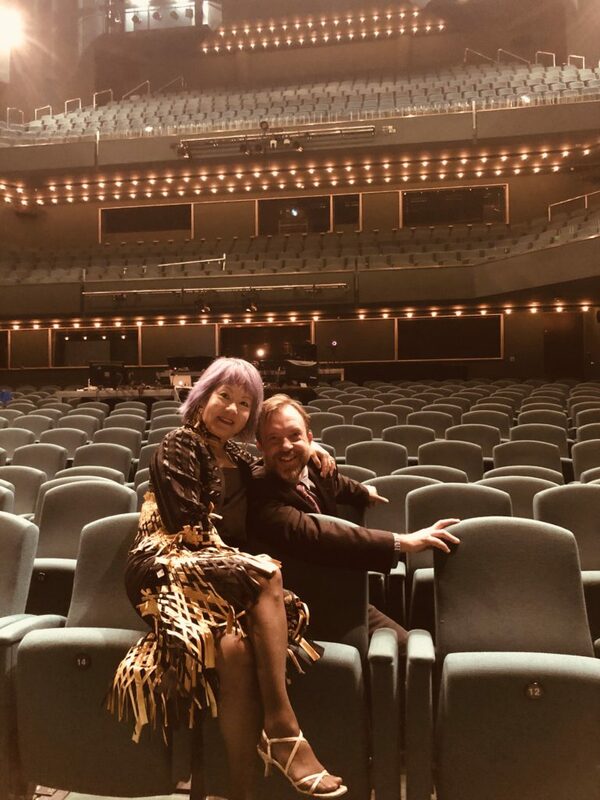 Cerise and the director, Michael Counts luxuriating in the theater. 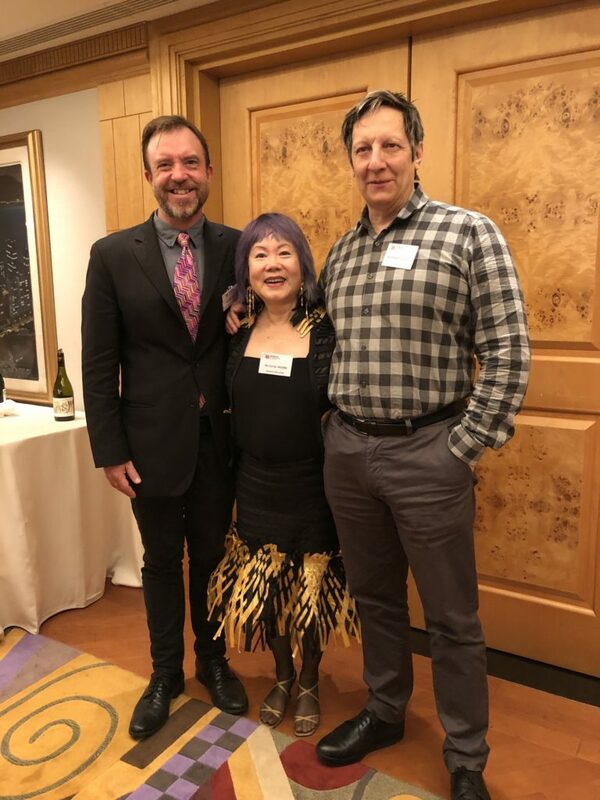 Surrounded by a bevy of directors – Michael Counts and Robert LePage at the Hong Kong Arts Festival Welcome dinner.